When is the admission form of NIOS board available? The examinations for Block I students are held in April-May and for Block II students, the examinations are held in October-November of the admission year. What is NIOS Eligibility Criteria? Education Qualification for Senior Secondary Course -Students must have completed class 10/secondary level of education from any recognised board of education. How to apply for NIOS board admissions? You need to click on Stream 1, if you are applying to NIOS for the first time. Stream 2 is for students who have already appeared for the examinations but could not pass the examinations, Stream 3 is for On Demand Examinations at secondary level and Stream 4 for On Demand Examinations at Senior Secondary Level. You need to fill e-mail Id and create a password for your account. Once, you submit the registration details, your account will be created and a message will be displayed confirming your registration. In case, you forgot your password, you can recover it by clicking on 'Forgot Password' option available at Login Window. Read all instructions and proceed to fill the application form. Also, students can apply for Transfer of Credits in the same application form for NIOS. The application fee can be paid either in online mode using Debit Card/Credit Card of VISA or Master payment system only and through Net Banking of any of Indian Nationalised Bank. Or the application fee can be paid in offline mode using Demand Draft of nationalised bank, drawn in favour of Secretary, NIOS payable at respective Regional Centre. Check the list of regional centres. Step 4 - Submission of printed application form: You need to submit all the details,and get a print copy of application form and send the application form after enclosing it with required documents and photograph (2 nos.). 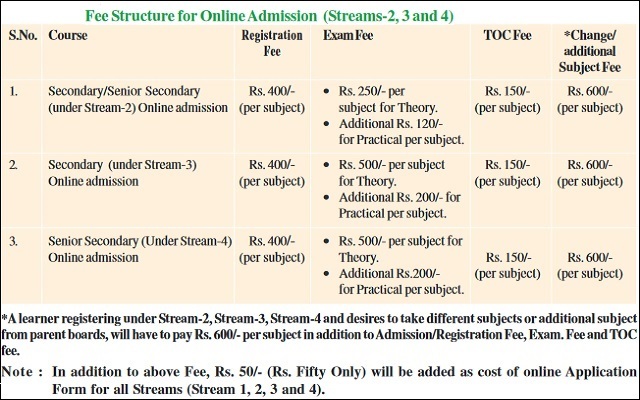 In case, you have submitted the application fee in online fee in online mode, then only the fee reciept is required but in case of offline fee submission, the demand draft is required to be submitted along with the application form on the official address as provided below under offline application process. You'll be directed to new page with Offline application form link (see in image below). You need to click on this link and download the application form (for convinience of students, we have provided the offline application form link below). After downloading the application form, students need to fill it in their own handwriting completely and affix the photograph and sign at the specified spaces. How can I know my admission is confirmed by NIOS? When a student submits his/her application form, the NIOS issues an application number/reference and after confirmation of their admission, they are issued Identity Card. However, if at any stage the student is found ineligible or the application form is not correct then their admission is cancelled by NIOS.